Disney In Pictures – Celebrations! Hello everyone! After our absence last week to celebrate Easter, we are back strong with another edition of Disney In Pictures! This week’s theme is Celebrations, and the pictures have been pouring in from everywhere! Thank you all so much for sharing your photos with us — that is what makes this series so cool! My name is Jessica. The 1st picture I am submitting is special to me because it’s the first time he got to meet Belle and understood who she is. As you can see, he is in love. Lol..He now calls Belle his Girlfriend. The look that he gives Belle is priceless. The 2nd picture is of my daughter and Cinderella. Cinderella is her favorite princess. This is special to me because when she saw her Cinderella, she ran up to her and gave her a kiss! I will be going back again to Disney in May, and I hope to get more pictures. Next up I’m sharing with you some pictures that my friend Bob from Pixie Vacations sent to me. Bob tells it best in his own words, so read what he had to say, then take a look at this pictures! We were both blown away by how good it looked when it was delivered, and just as impressed with how it tasted! It was our daughter’s 5th birthday and my husband was picked to do the Flag Retreat Ceremony at WDW!! He had just returned from sea and wasn’t able to stay for the full birthday trip but we were glad that he was able to make it down for the day of her birthday.We were so excited when he was chosen to do be the Veteran of the Day! We celebrated our daughter turning 5 and his homecoming all in one very special day!! This picture of her’s is special, but to get the full effect, please check out her blog post about the day! Just click on her picture to head over to it. Lastly, thank you Brandon for your service to our country! It is greatly appreciated! 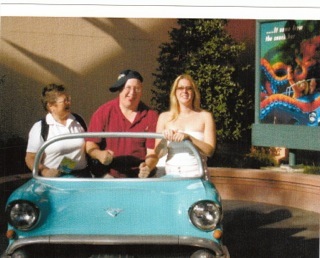 My friends Roger and his wife Brenda are writers for Mouze Kateerz, but they also have their own blog called “Back To Disney.” Roger sent me some photos from various celebrations they have had, and told me to pick one, but I like them all, so here they are! Roger & Brenda Ford, our first trip together, 2003, our honeymoon trip! Our first trip with Brenda’s daughter, Jenn. 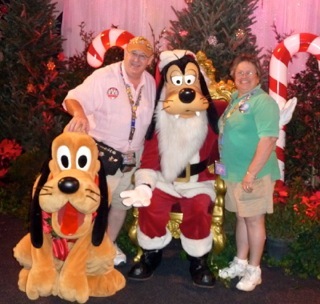 2011, Our first Christmas trip (together–Brenda went without me in 2010! ), our 10th Anniversary, and Brenda’s 60th Birthday! These pics were taken on my sons 3rd Birthday. He has autism and you can totally see the shock and awe effect when he meets Buzz and Woody. You can also see it when he meets Mickey with his sister. My son is Jonathan and my daughter is Julia. 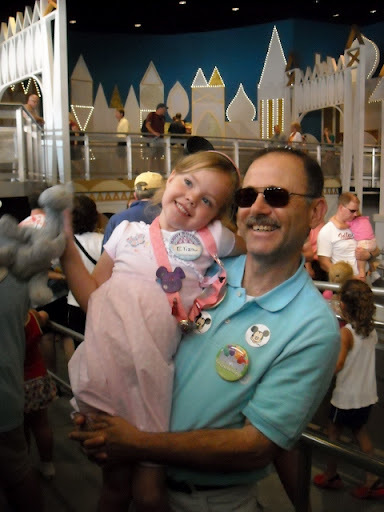 The best day of my life was my 60th birthday spent at the Magic Kingdom! I was celebrated and serenaded by cast members and the day was truly magical. The photos I’ve attached are just a tip of the iceberg. Here’s the link to my Picasa album from that day. You’ll see my great photos of the old skyway station in Fantasyland and a lot of other great photos. Next up are some photos from one of my readers, Lisa, who sent me a few photos to share! Celebrations are always exciting, so take a look at these! Lisa’s Mom celebrating her birthday! Lisa celebrating her birthday at the Flying Fish! Best Day ever!! The looks on the boys faces are priceless. We had so much fun with Pluto and Goofy. Also loved the fact that we are in our family matching shirts. “To……the most beautiful birthday Princess! Love, Anna – Your Fairy Godmother” wrote my daughter’s “Fairy Godmother-in-training” in her autograph book, at the Bibbidi Bobbidi Boutique in Downtown Disney. See my review and our experience at Tips from the Disney Diva. After “Anna” turned my little girl into a Princess, we proceeded to Epcot and had the most exquisite time at the Akershus Banquet Hall. What a magnificent way to spend a Birthday with the Disney Princesses! Cinderella chose my daughter to lead the Procession around the Restaurant with her. What a honour it was for my Princess. Below is a photo of her receiving a card signed by the Disney Princesses. 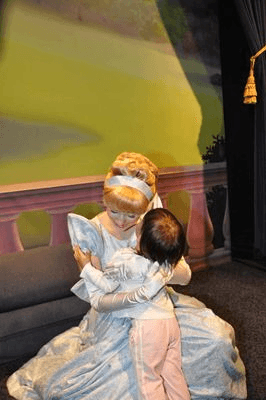 A treasure we will keep, to reminisce this perfect Princess Birthday Celebration at Walt Disney World. A Princess has got to eat, right? I have always been meaning to send you a photo and finally I was in front of my computer when you put the call out. So here it is. This is my husband during the Year+ of a Million Dreams. This was taken on a special trip. It was when we were dating and we went together with his son on our first ‘family’ trip. During that trip we racked up the wins as you can see. Just added to the magic of the trip. 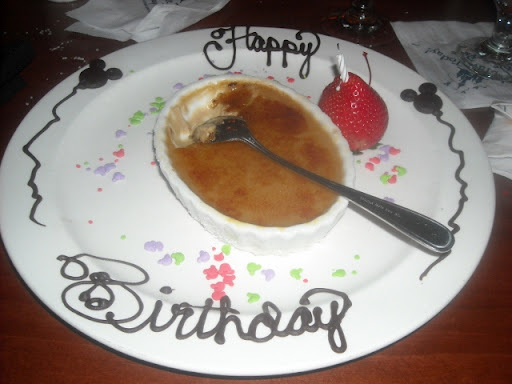 I had the most wonderful birthday celebration at Via Napoli after a delicious meal, which I reviewed at Focused on the Magic. They really know how to celebrate and it’s all in Italian. The servers gathered around our table and sang a rousing rendition of the Italian Happy Birthday song while clapping, dancing and then presenting me with a special Italian dessert. I have no idea what they were saying but the sentiment was greatly appreciated. It really made my birthday lunch a great celebration!! We have a family tradition that when we are at Disney World on your birthday you get to pick the entire day – breakfast, park, rides, lunch, dinner – everything! Last summer we were there for my son’s fifth birthday, without hesitation, we had breakfast at Ohana – here he is getting his first birthday hug of the day, from the big guy himself, Mickey Mouse. It set the tone for the rest of the day, lots of smiles and hugs! The final one is from a couple of years ago for my daughter’s 5th birthday. She even convinced her granddad (my father) to go to Disney with us. She picked the Magic Kingdom, and just like her mommy, she was all about it’s a small world. Although this past year we went for her 7th birthday and she picked Boma for breakfast, Epcot as her park, and Jiko: The Cooking Place for dinner – she sure is growing up fast. Thankfully, you are never too old for Disney! Eating at ‘Ohana and hugging Mickey Mouse! What an incredible set of photos, everyone! Thank you so much to everyone for sharing them with me and our readers! This has been a long post, I hope you have all enjoyed it, and I hope you’ll stop by during the week and next weekend also for more Disney posts! Disney in Pictures — Magical Parades! Disney in Pictures – Favorite Restaurants! Disney In Pictures Theme: Disney Coasters!